A reflection is a transformation that flips a graph over a line, called the line of reflection. 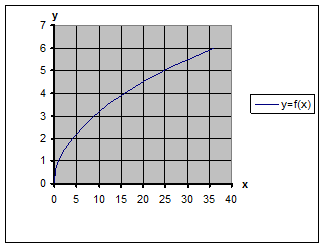 The graph of y = - f(x) is the reflection of the graph of y=f(x) about the x-axis. 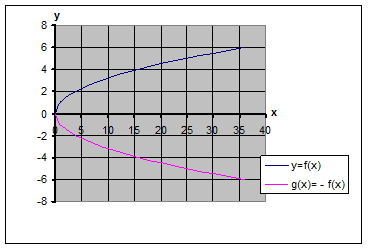 The graph of y = f(-x) is the reflection of the graph of y=f(x) about the y-axis. Use the graph of f(x)= x2 to obtain the graph of g(x)= - x2. 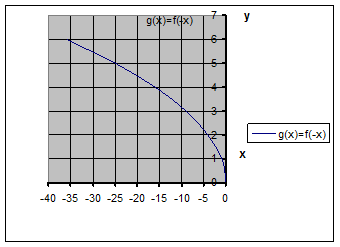 Since g(x)= - f(x) then the graph of g(x) is the reflection of the graph of f(x) about the x-axis. g(x)= - x2 (red graph). 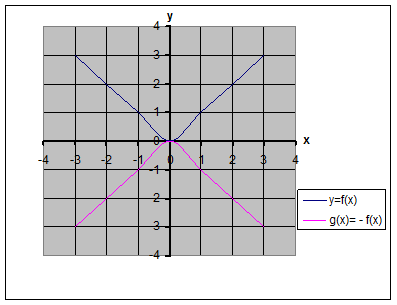 Use the graph of f(x) = |x| to obtain the graph of g(x)= -|x|. Use the graph of f(x)=x3 to obtain the graph of g(x)= - x3. Use the graph of f(x)=√x to obtain the graph of g(x)= - √x. Use the graph of f(x)=√x to obtain the graph of g(x)= - √x..
To graph g(x)= -|x|, we first graph f(x) = |x| (blue graph) and then reflect it about the x-axis. The graph of g(x)= -|x| is the red graph. 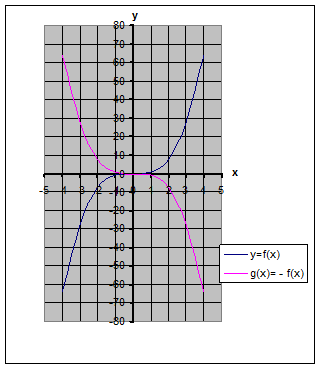 To graph g(x)= - x3, we first graph f(x)=x3 (blue graph) and then reflect it about the x-axis. The graph of g(x)= - x3 is the red graph. To graph g(x)= - √x, we first graph f(x)= √x (blue graph) and then reflect it about the x-axis. The graph of g(x)= - √x. is the red graph. Note that the domain of both functions is x ³ 0. 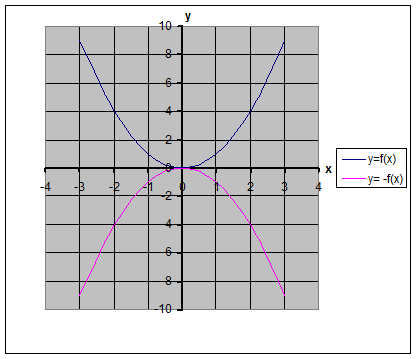 Use the graph of f(x)= √x to obtain the graph of g(x)= √-x. about the y-axis (second graph). Note that the domain of f(x) is x ³ 0 while that of g(x) is x £ 0.